Face the Art Entertainment - Photo Booth Rentals| Photobooth | Face Painting | Clowns | Bubbleology | Henna | Entertainers | Balloonists | Theme Parties | Party Rentals | Candy Art | Inflatables | More! Do you want to add EVEN MORE fun and excitement to your event? Do you want to capture the moment and have your guests bring it home forever? We are sure you do! 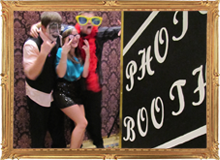 With our Photo Booth rentals we have what you need! Our booths are not a traditional rectangle you cram into, but rather an open concept booth where there is plenty of room for large groups and small. Let us come in, set everything up, assist your guests with their experience, clean up and leave you and your guests with memories of that special day forever. From start to finish there is always an attendant on site to guide everyone to have an unforgettable experience. Our Photo Booth's in Episode 2 of Four Weddings Canada! *CHOICE for Platinum: Black, White, Damask, Tropical Beach and Fantasy. BONUS ENTERTAINMENT: CHOICE OF COTTON CANDY, POPCORN, SNO CONE, 1 HR FACE PAINTING, 1 HR HENNA OR 1/2 HR BUBBLEOLOGIST. 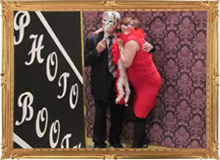 Our Photo Booth is customizable to enhance your wedding, event, gala, festival, fund raiser or private party. We can even do pay per use events. If there are any items you can think of that we do not have on the list then let us know and we can work with you to make it happen! Virtually anything is possible! If you need more information please contact us by email: info@FaceTheArt.com or by calling 519 - 772 - 5378. We will help guide you through your experience!